Our 2018 film lineup has arrived! We’re thrilled to present a program that emphasizes what Sled Island does best: showcase the work of emerging homegrown and international talent, present one-of-a-kind cinematic and musical experiences and explore art and music through film. This year’s theme? We have a few. Counterculture, 20th century icons, emerging talent and collaboration all make appearances in this year’s film program. 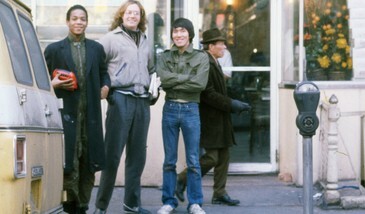 From Yony Leyser’s brilliant documentary Queercore: How To Punk A Revolution to a visceral exploration of iconic artist Jean-Michel Basquiat and late 1970s New York City in Boom For Real: The Late Teenage Years of Jean-Michel Basquiat (pictured), we explore the adversity that creates community and art. We continue to look at iconic artist lives in Nico, 1988, a haunting portrayal of singer Christa Pӓffgen’s final act. Following a memorable Canadian premiere in 2017, Videokills - The Explorer Series: Invisible City Symphonies brings back the Berlin-based artist group Videokills for a special night of international short films—created just for our festival—accompanied by original scores composed and performed by local bands. We’re excited to partner with Indigenous Resilience in Music, Treaty 7 Film Collective and imagineNATIVE—the largest presenter of Indigenous film in the world—for imagineNATIVE Film + Video Tour, a showcase of Indigenous Canadian filmmakers on National Indigenous Peoples Day. Throughout our program, we’re including shorts from emerging local, Canadian and international directors and animators, with a selection from Sled Island 2018 guest curator Deerhoof (Hit, directed by Becky James and screening with Boom For Real: The Late Teenage Years of Jean-Michel Basquiat) and an emphasis on women filmmakers. Tickets go on sale this Friday, April 13 at 10am MST at SledIsland.com/Tickets. Tickets for imagineNATIVE Film + Video Tour will be available later this spring. Remember that a Sled Island pass gives you access to film programming as well as music, comedy, art and more (subject to capacity). Get yours by Monday, April 30 at SledIsland.com/Passes and you could win the ultimate Sled Island experience!